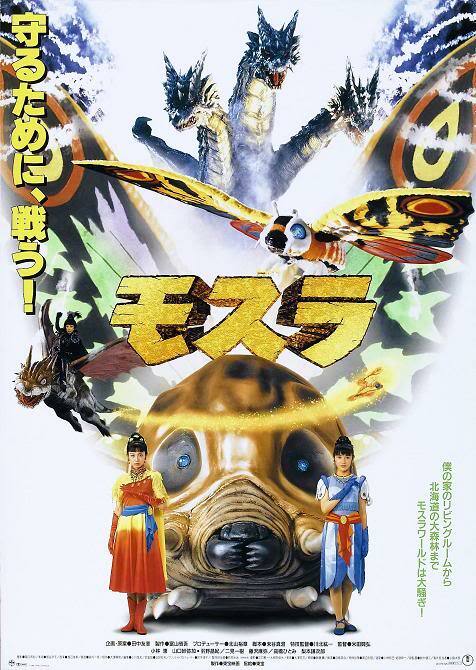 Rebirth of Mothra (1996) – SKREEONK! Surprisingly enough, Rebirth of Mothra was billed simply as Mothra (モスラ Mosura) in Japan, the same title used for her first film decades prior. In 1995, Toho sent their most famous and beloved creation, Godzilla, into the kaiju afterlife with his spectacular exiting film – Godzilla vs Destoroyah. The King of the Monsters would, of course, return in 1999 to kick off the Shinsei era. Yet Godzilla’s temporary and emotional absence left Toho Studios with a rather large void to fill. And what better monster to pick up the slack than the one kaiju that many consider to be Godzilla’s equal? First of all, this is a kiddy film or family film as some call it. I know some people have very radical negative opinions about this movie because of this. I understand their point, but I think they are being unjust to the film bashing it because it belongs to a certain genre. Its a bit like complaining that “Narnia” is not “Lord of the Rings” or that “Star Trek” is too much of a science fiction film. Rebirth of Mothra is a kid film and this is how I’m going to review it – for what it is. So is this a good or bad kiddy film? Not going into too much spoilers, the plot is your stereotypical tokusatsu/fantasy thing. The big bad monster was set free and now the good guys have to stop it. In this aspect it is not much better, but also not much worse than similarly-themed Disney films of this time. I personally think that both the pacing and the narration is more centered on the human and shobijin characters than on kaiju themselves. It feels a bit more like a traditional fantasy or a “distaster film” in this aspect – the spotlight is on the characters and less on the kaiju and special effects. There are a few minor plot holes, but they are not too distracting and younger viewers may not even spot them. All in all the plot starts very light&fluffy with the action centered on the child characters and the three shobijin. However it gets a bit tougher mid-way. 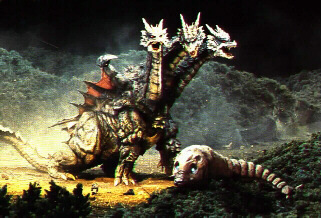 Not to state any spoilers, but there is at least one emotionally-taxing scene and the first kaiju fight in the film is rather brutal for a kiddy film with Ghidorah stomping and biting the little Mothra larva to the point it starts to bleed. Arguably this may be even a more brutal scene than showa-era Mothra battles. This doesn’t get anywhere near the darker themes you had in Hedorah or Biollante and older kids should be ok. However younger and more sensitive preeschoolers may be scared or cry, so keep this in mind if you want to watch the film with a small child as the light&fluffy begining of the movie may be a bit misleading. The music is similar to any kid fantasy-adventure film of the 1990s and not all taht different from american productions of this era. It fits the film, but lacks any really memorable themes if you ask me. It generally does what its supposed to, but otherwise is pretty average. Also, the fim has I think 3 full musical song scenes. While a song to call Mothra was to be expected (carrying on the traditions of Showa Mothra films), the other two seem to just slow down the pace. Mind you that the Shobijin are played by real life pop idols, so the songs are not that bad. I think it is inspiration from contemporary disney films of that era, but still it feels out of place and “forced” into the film. 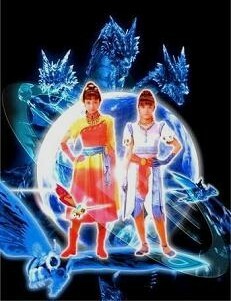 It gives it a bit of a “Bollywood film” vibe which does not mesh well with the “Kaiju film vibe” in my opinion. 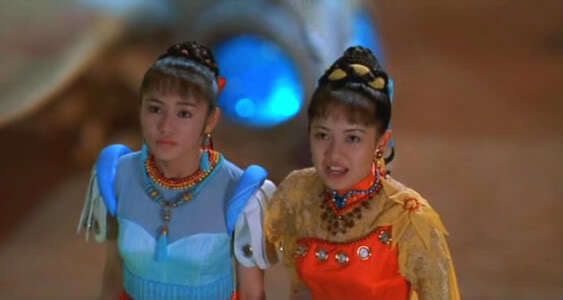 The “good” shobijin are played by Kobayashi Megumi and Yamaguchi Sayaka, who were both popular teen pop idols at the time. Yamaguchi has the admittedly harder “more emotional” role and sometimes her acting feels too emotional. If you ask me, she is the weakest link of the adult cast. She is not horribly bad mind you, just a step below the other cast members. Perhaps its because she was given a harder role and she would perform well in a less exposed one. Kobayashi fares much better, albeit with an simpler role. While not the best acheivement of japanese cinema, both play their roles ok and I can’t say I mind them here. Hano Aki plays the “bad” shobijin. Adittedly her role is a pretty bland “moustache-twiching” old-school evil character. Smaller kinds will probably not mind this, but she admittedly is one of Toho’s one-dimensional villains. To give justice to Hano, she tries to bring some life into this role with expressive movements and sometimes intentionally-funny and over-the-top facial expressions. The end result is a very disney-esque old-school emotional villain, which is not that bad given how one-dimensional the screenplay for the role was. Come to think of it, Hano did quite a good job with the limited options she had. The child characters are your typical 10 year old brother and slightly younger sister. They a bit annoying, but much less annoying than child characters from showa era films if you ask me. The child actors are not exceptional but not very bad. About the same level as most child actors in japanese or american cinema. The adult characters are your realistic japanese mom&dad. They are a bit bland, but otherwise ok. Nashimoto Kenjiro gives a fun and believeable performace as the modern sarariman head of the family. All in all the characters are ordinary japanese that are somewhat likable. All in all acting is solid for a tokusatsu film and probably one of the stronger sides of the film. I heard form a whole lot of people that the american dubbing is notoriously bad and ruins much of the acting. I can’t confirm this (I don’t watch dubs), but I thought I should mention this opinion as it is overwhelmingly prevailant in the US fandom. 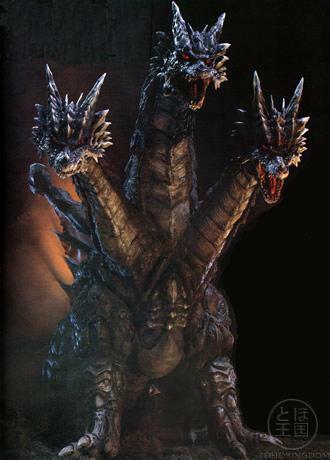 In the film we will see 3 kaiju – DesGhidorah, and two mothras. I know people vary widely in their opinions about this Ghidorah. Personally I find it to be good. I liked the Showa Ghidorah very much, but I like this design as well. In contrast with most of the film, DesGhidorah is dark with shades of metallic grey, black or brown and looks rather menacing. She is clearly different from the cuddly Mothra designs and the kids will easily figure who the bad guy is just by having a look at them. And then we have the Mothras. 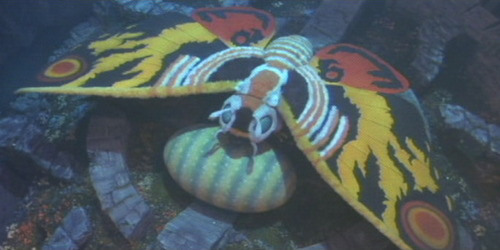 The baby larva mothra is similar to the Showa one, but the adult Mothra is slightly different. Generally, she looks very toy-plush-cuddly. I personally think they went too far with this, but children may likely enjoy this. In general the film is very colorfull, kiddy and maybe even somewhat “girly” in its visual aspect. The shobijin wear very colorfull korean-fantasy-like robes, their small moth mount is colorfull and plush-toy like. The “bad shobijin” wears darker colors of course, but even she too looks somewhat cute-fantasy style, like “Siouxie Sioux on a bad hair day” as someone pretty accurately described. I’m not that big of a fan of this style, but arguably it “goes with the flow” of the film and contributes to the “colorfull good guys vs bad guys in dark attire” element that is typiclal for kiddy films. The battles are somewhat different from regular kaiju films. There is a lot of fast “fly&fire” action with clorfull beams and powder going left and right. Lots of “power flashes”, sparkling lights and bruning forests. Yes forests – the action takes place in sparesly populated Hokkaido. There are no “city battles” and as far as I remember the only human structure that is destroyed is a dam and even that dam busting scene is filmed from a distance with smoke obstructing most of the view. The film decidely lacks Toho’s trademark “scale model set destruction”. While some effects like the sparkling moth powder, look impressive, most are pretty bland “laser beam&fireworks”. Its not that special effects are badly done here, its just that they lack that certain “Toho spark” we learned to expect, there are simply no “awe inspiring” special effects destruction scenes like in some old Showa movies or the 1984 Godzilla movie. In my opinion, special effects are one of the weaker points of the film, especially in comparison with earlier Toho productions. I dunno, maybe Showa era effects simply “aged better” than the mid 1990s effects? On a more positive note, in contrast to giant monster battles we now get one “micro” battle in the film. The fight I mention is when the good and bad shobijin dogfight on their tiny mounts inside a house. This battle is pretty fun, zany and fast paced – a very cool scene for a kiddy film if you ask me. The Good: Some pretty positive acting from a part of the cast, a consistent colorfull-fantasy theme, some fun action scenes. The Bad: The plot is not all that original, at times “musical-film-style” songs brake up the pace, special effects lack the “Toho spark” we might expect. Final verdict: It can be a fun movie if you judge it for what it is – a kiddy film. If you desire some darker and more mature kaiju action, then skip this film and go watch Godilla 1954, Godzilla 1984 or Godzilla vs Hedorah instead. If you want a light movie, or a family film to watch with your child then Rebirth of Motha will do nicely. Parents of younger or sensitive preschool kids may first want to watch the film themselves and decide if its good for their children, as some scenes may be suprisingly emotionally-taxing in what is otherwise a pretty fluffy&cuddly kid-friendly movie. Posted on September 6, 2011 4 By Jon D. B.	Kaiju Movie Reviews! Posted in Kaiju Movie Reviews!, Toho Movie Reviews! Next Post Make Mine Marmit! It’s a KFN Collector’s Update!